Looking for interview questions for your job candidates that will help you assess their conflict resolution skills? Conflict resolution skills and the ability to disagree with others professionally and politely are necessary for successful contribution in organizations. If every employee you hire is willing to engage in conflict resolution, more new ideas and better approaches to solving problems and improving processes will take place in your organization. Conflict resolution skills are necessary for healthy interpersonal relationships and in building effective teams. Conflict resolution skills and the willingness to disagree are practices that can help you better serve customers. Disagreement to keep your organization innovating and continuously improving is essential. 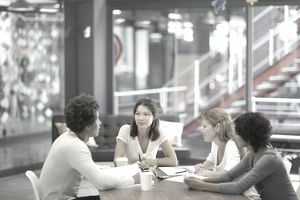 Disagreement can strengthen the bonds between your employees as they pursue understanding the other party's point of view. Disagreement and conflict resolution rarely occur in an interview setting because every participant is behaving professionally. The goal of the interview is to make a good match, so it’s a challenge to identify your candidate’s strengths in conflict resolution and disagreement. The following sample interview questions should help you pinpoint your candidate’s strengths and weaknesses in the area of conflict resolution and disagreement. Tell me about a time when you disagreed with an idea your coworker wanted to pursue. How did you approach the disagreement? Think about a situation in which you disagreed with the direction or idea that your boss suggested. What did you do to professionally disagree? If not, what were your thoughts about the situation? When you work with a team or a group, disagreement about direction, decisions, and even mission and vision, are common. Tell us about a time when you handled a disagreement. How did you approach the situation and what was the resolution? When you think about your experience with disagreement and conflict resolution, how would you rate your skills in handling differences of opinion? Please give an example that illustrates that skill. How comfortable are you, in general, with dealing with differences of opinion and disagreement? Can you provide a work-related example that illustrates your comfort level? The leader of a team on which you participate consistently talks more than all of the members of the group. Consequently, his views largely direct the actions of the team. He is smart, wants participation, wants the other members to step up, but no one practices the professional courage necessary to make the team successful. What would you do in this situation? Think of a time when you worked with a coworker who would seem to agree with the direction decided by a group. But, for weeks and even months later, the coworker continued to raise objections to the decisions made by the group. How did you address this situation with the coworker? If not, what were you thinking about when you decided not to confront the ongoing problem? As a manager, tell us about a time when you and a reporting employee disagreed about a direction, how you handled a situation, a performance review, or suggestions for improvement. How did you handle the disagreement? As a manager, I’m sure you have experienced situations in which employees were in conflict and disagreed with each other on important issues. What is your preferred approach for helping the employees resolve the conflict? As a manager, you represent the interests of a particular department or company unit. While the overall direction is set by senior managers in most situations, it is up to the manager of a particular unit to set the direction for their staff. How did you deal with a situation in which you disagreed with the direction in which other managers wanted to lead their teams? When you review your candidate's responses to questions related to conflict and disagreement, how appropriate did you find their responses? How articulate is the candidate in the responses offered about dealing with disagreement? Whether the candidate is applying to manage the work of other employees or you just need an individual contributor, how clearly did the candidate communicate what he or she did to manage the conflict or disagreement? Was the candidate able to identify specific conflicts in which he has participated? If not, you may have spoken with an individual who avoids necessary conflict for whatever reason. This is not good when you are looking for an effective team member. If the candidate did provide examples, did you think the candidate effectively addressed the conflict? Did the candidate avoid, put up with, or too aggressively address the situation? Is the candidate’s conflict resolution style congruent with the norm in your organization? Is the candidate willing to participate in conflict and disagreements? Try to assess whether the individual’s approach to conflict is appropriate and preferred. Find more information about dealing with conflict and disagreement.